Paddy Donnelly, owner of Iampaddy, Belgium based website, chats with Calvin Lee, principal and creative director of Mayhem Studios. Self-Proclaimed Media Ho, Designer Guy and Twitter Addict. In his spare time, Stunt Doubles for the Hulk and a really Nice Guy! Calvin Lee is one of the most retweeted users on Twitter and gives us his thoughts on his Twitter addiction and how it should be used. Head on over to Iampaddy and read the interview, How Do You Twitter: Mayhem Studios?. 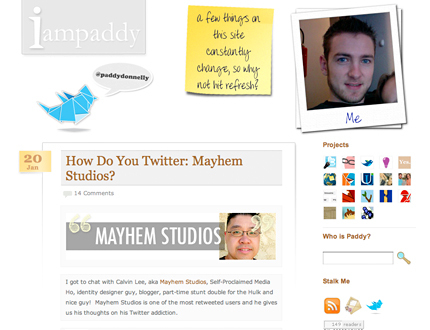 You may also follow @mayhemstudios and @paddydonnelly on Twitter. Paddy Donnelly is a web designer, illustrator, blogger and eternal student from Ballycastle, Ireland who journeys through the Internet every day looking for interesting, funny and weird stuff, like everyone else. He has been known to drop everything to partake in Internet projects, which distract him from the monotony of regular life. His online adventures have been in a constant effort to study social media’s effects on education and the daily lives of creative individuals, while discovering the path to constructing a valuable online presence for himself in the creative web community.